You’ve probably noticed a few weird posts here and there on Facebook/Twitter/Instagram over the last few weeks where I have hinted that Greg and I may be up to something. Well, those posts aren’t a figment of your imagination. We are up to something! 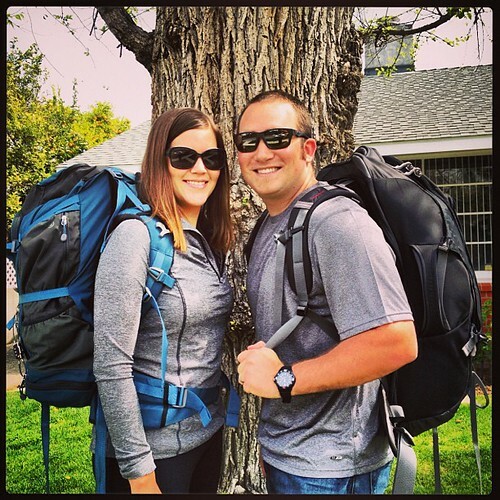 Greg and I are off on a 6(ish) month round the world (RTW) trip! We both quit our jobs, boxed up our home, filled two backpacks with a weeks worth of clothes, and are off on an adventure of a lifetime together. Holy Crap! I know, right?! We began our trip this week (where we spent our first night on a thin mat with less than clean sheets after a 12 hour flight where the sun never set and we didn’t sleep for 24 hours….that was fun!) and will be heading to Japan, South Korea, Hong Kong, Vietnam, Thailand, Philippines, Malaysia, and Indonesia during the Asia leg of our trip. Then the plan is to head to Europe to explore Greece, Croatia, Austria, Italy, Switzerland, France, UK, Germany, and Ireland. Hopefully we actually make it to all of these amazing places, but basically our whole trip is up in the air and will be decided when we find cheap plane/train tickets, we get a good suggestion from someone, or we get lost and just end up there! As of now, we don’t have Australia, Africa, Central, or South America on the “itinerary” but you never know! Along with this new adventure we also have a new blog name, HeyNoobz.com! Although I feel like we will forever be SFnoobs, this site will no longer be only about San Francisco (all the posts are still here though so feel free peruse if you’re planning a trip or just need some San Francisco weekend inspiration). You’ll also see that my Facebook, Twitter, and Instagram names changed to HeyNoobz too. Be sure to follow the blog/Twitter/Facebook/Instagram for all our adventure updates! Also, if you know some good tips about this world, whether it be the best ramen you ate in Japan, the most beautiful sunset you saw on a remote island in Thailand, or the place you absolutely hated in _____ and will never go back, let me know in the comments! Our trip is wide open to adventure and we would love to see/eat/play in all of your favorites! First stop: Tokyo, Japan! I’ll tell you all about it soon! So excited to read about your adventures! Hopefully will be able to meet you in Europe in 3 months or so. Love and Miss you both already!! OMG, so fun Can’t wait to read about your adventures! Just whatever you do, please don’t get TOO close to the North Korean border. I do not want to have to start an international incident for you guys (but I will). Also, have FUN! We miss you already, but can’t wait to read all about your adventures.